Can you believe it's almost July 1st? Eeek, I can't believe how fast the year is going?! Today I have a fun little treat favor to share with you:) With the 4th of July right around the corner, I made these yummy sucker pops for Arya's daycare friends. I started with a double stuffed Oreo cookies. I dipped a sucker stick in Wilton candy melts and stuck it in the center for the Oreo cookies. I let it sit for about 5 minutes just for the stick to set. I then went back and dipped the whole cookie and laid it on wax paper, added sprinkles and let it set. I packaged them up in a little cello bag and tied on a tag. The cute little tag is created using the SU oval punch and the sentiment is Craftin Desert Diva's~Celebrate Freedom stamp set. Super easy and I am sure they it will be a hit with the little ones :) I mean who doesn't like Oreo cookies....yum! Super cute and yummy too! Happy 4th of July my friend. Oh my goodness, I wish I were one of Arya's daycare buddies!! Yummo!! These look so delish, Sherrie!! I love how you decorated them!! The sprinkles and twine are perfect!! I so need to make a run to the store for Oreos now!! Very yummy treats and double stuffed oreos, super yummy! I think I'm going to have to try this with my peanut butter ritz cracker sandwich that I dip in chocolate. I will add the popsicle sticks for a fun treat. Ohhhhhh these are soooooooooo fun! I love them!!!!!!!!! Oh my oh my! I love these sooo MUCH! You are just the best my friend, the daycare friends are so lucky! Hope you are well my friend! OOHHHHHH What yummy treats Sherrie!!! I know the kiddos are going to LOVE them!!!! 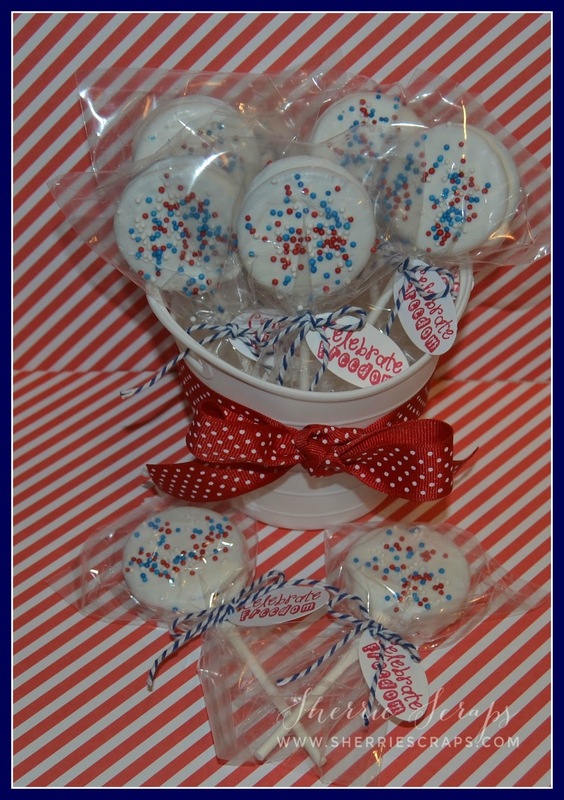 AWESOME job and such a fun 4th of July idea!!!!! Yummy, yummy wish one of those were in my tummy. Love how you decorated them. I know they will be a huge hit at the daycare. YUMMY!!! Thanks for linking up to the Craftin Desert Divas Red, White & Blue Linky Party! Super cute! Thank you for sharing over at Craftin Desert Diva's linky party! Okay, I am definitely going to try this! What a yummy idea. Love the sprinkles and sweet tag. This is such a wonderful treat! Too funny I thought I commented on this earlier, but what I did was went and bought cookies and ate one instead thanks for the inspiration. Super cute project. These dressed up and very patriotic suckers are fantastic!!! 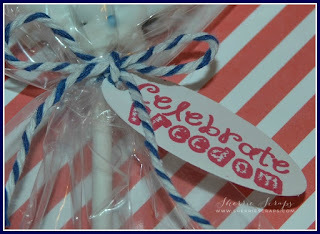 I love the little tag that says celebrate freedom! Afterall, that is what Independence Day is about too right? :) Lovely project my friend! Thank you so much for joining us this week in our Funday Friday challenge! I would love to make these......yummy, they look fabulous! Just wondering whats a double stuffed Oreo is? 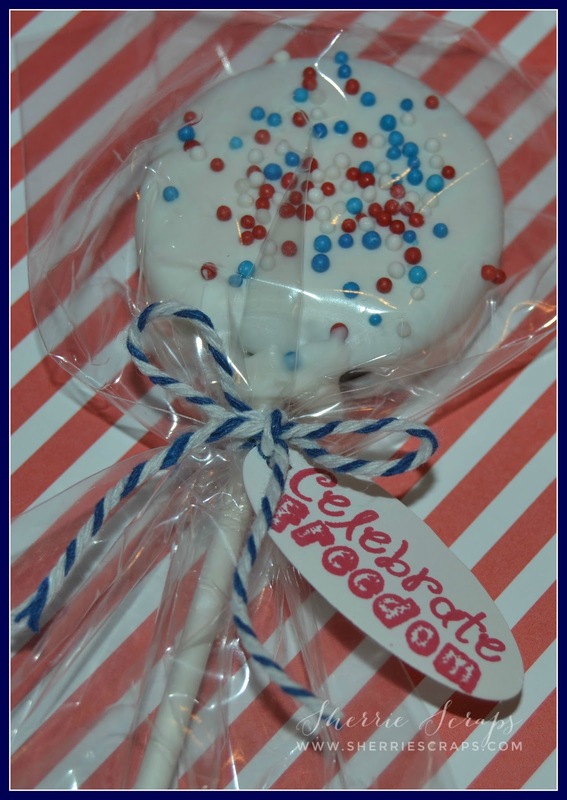 Super cute, fun and YUMMY! !